A saint who carries out the prophecies of the Divine. “ It seems only those whose hearts are broken can hear the voice of God. Or maybe, it's the other way around; God only talks to them. who spread it are dangerous. who have been chosen by God to punish them. Does one have to be chosen by God to recognize Imposters? Yes, and no. After all, Imposters can also recognize each other. but usually it's slower in women. Fear of Imposters begets heresy. so they could pursue Imposters. They'd been chosen for God's holy work. until they're burned at the stake. when she witnessed this unspeakable act of heresy. She punished the heretics and saved the girls. There were only two choices for these girls who were forced to hear God. They could either join the Imposters or become His true avengers. It seems only those whose hearts are broken can hear the voice of God. The Female Priest is a devout warrior of faith, driven in the pious quest to serve as God's avenging angels. Deceived by the Imposters as a young girl and infected with their blasphemous corruption, she was rescued from the brink of death by His true servants and followed His shining light. The Female Priest fights against the Impostors with her loyal devotion to God in hand and with large, terrifying weapons in the other. Not as bulky but generally more mobile compared to Male Priests. Does not use her fists in basic attacks, giving them more consistent range. Possesses a an innate healing skill. All of her subclasses have some method of supporting her party members. A magic-based class that purifies her enemies with a mix of Light damage spells and sweeping strikes with her Cross. 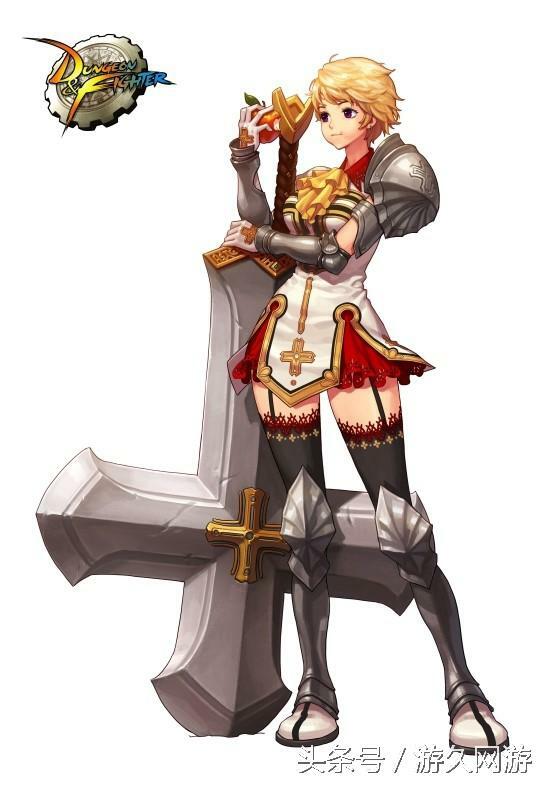 Similar to her male counterpart, she has numerous skills focused on support, such as increasing her allies' offensive stats with Valor Blessing, healing them with the holy song of Regenerative Aria, and even bringing them back from death with Resurrection. She may be slow, but her Crusader Plate Armor Mastery allows her to take hits fairly well. Unlike Male Crusader, Female Crusader's builds usually aren't split as harshly between Support and Battle, and instead incorporate a little of both. A fanatical warrior of God who wields Battle Axes and the flammable holy water, Flege's Essence. She dispatches any heretics who stand against her with the Holy Fire that covers her weapon, crushing them underfoot and even cleaving them in two with brutal attacks such as Decollation. Her foes are marked for death with the Heretic's Brand, making them more susceptible to her flames, and take more damage from her party. She also has access to the unique Incinerate debuff, a burn so severe that it holds enemies in place when afflicted. A mystical spellcaster who is the chosen representative of the Sacred Dragon, a Suju deity. By channeling the Saced Dragon's power through her Rosaries and talismans, she uses a variety of ranged spells to exorcise evil from the monsters plaguing Arad. From trapping foes in an onslaught of her rosary beads with Rosary Prison, chanting in sacred tongues to create a deluge of magical bullets with Exorcistic Plasma, or even summoning the Sacred Dragon to dive into enemies with Dragon's Fury, she possesses a wide variety of offensive spells. Her Shaman Prayer increases Skill damage for her entire party, making her capable of providing some support as well. By choosing to bear the weight of mankind's sins, the Mistress obtains a Sin-burdened Body, which constantly tempts her foes to come closer and lowers their Elemental resistances. Once her enemies are within range, it's only a matter of time before they lose their lives to the blade of her Scythe. Drawing power from the Seven Deadly Sins, she dispatches her foes with a mix of deadly scythe techniques such as Scythe Massacre and demonic attacks like Lars the Scudding Demon. Her signature ability is to become the personification of the Original Sin itself with Seven Sins of Corruption, transforming into a seductive and deadly demon. The Various Elongated Weapons Wielded when Equipped with a Rosary. The Female Priest was released with her own theme song, entitled Embracing Me, sung by Mirae & Dazbee. The Female Priest was originally illustrated as a young bubbly girl with blonde, wavy hair wielding a cross and garments adorned in brighter colors in contrast to her current design. 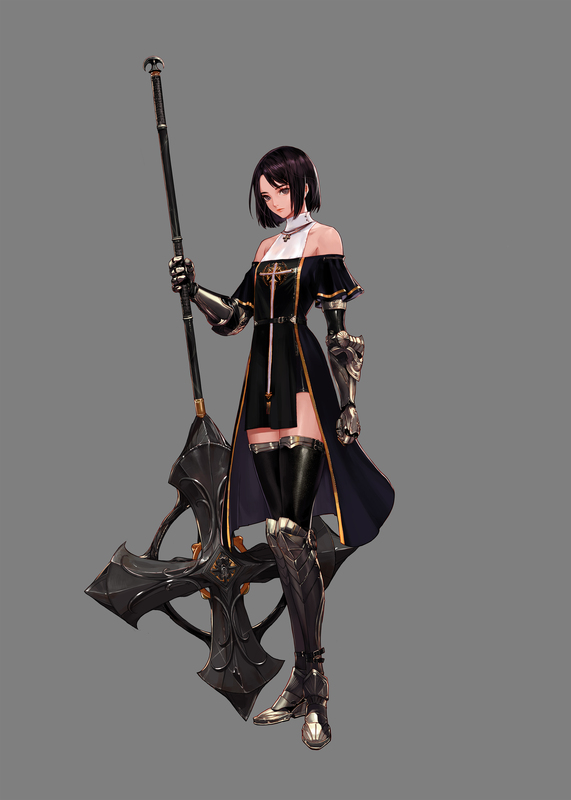 If the Female Priest equips a rosary, then rather than be strapped to her back like the Male Priest, the rosary will float behind the priest as she wields an elongated weapon instead. Additionally, when a subclass other than the Shaman, including the base class itself equips a Rosary, the elongated weapon will change depending on the subclass in question. The elongated weapon itself is for aesthetic purposes and does not provide any stats or bonuses; the Rosary's stats and bonuses will still be applied.